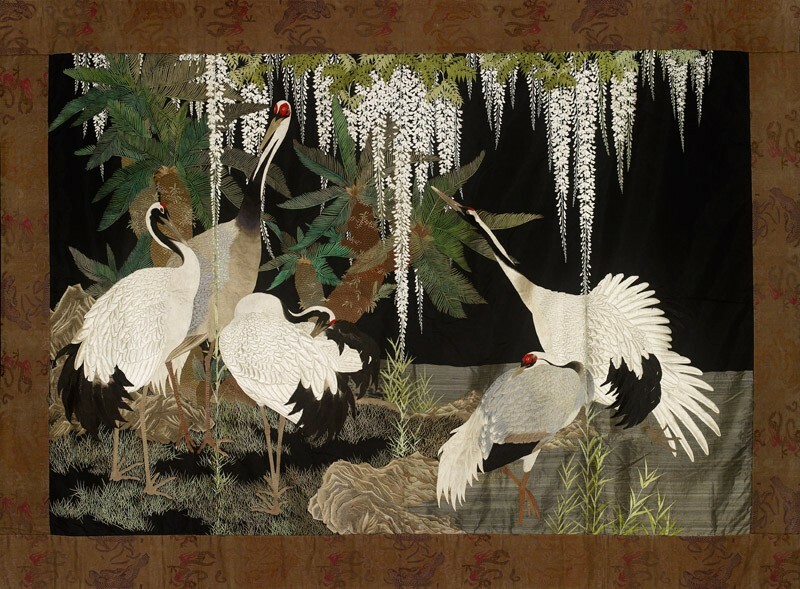 Large silk hanging embroidered in coloured silks, within a silk and metal thread brocade border. The whole backed with a cotton tsutsugaki fabric. 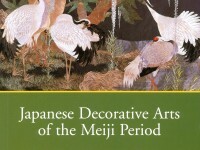 The design of five Japanese Cranes (Grus japonica; Japanese tanchō) standing on rocks and grass amid cycads and white wisteria. The added border has a repeating dragon motif and the reverse, stylized chrysanthemum flowers. The four panels were carefully designed to compose one large piece, not a four-fold screen, by the careful placing of the extra-long inflorescences of the wisteria along the joins. The ground fabric is a black, finely ribbed silk. The embroidery is mainly satin stitch, couching stitching and knotwork. The range of textures is achieved through the use of threads of various thicknesses and varying degrees of twist. The glossy feathers, for example, are stitched with floss silk of practically no twist, whereas the rougher bark and rocks are worked in a combination of loosely and tightly twisted threads. Clusters of knots create moss and lichen texture on the rocks. 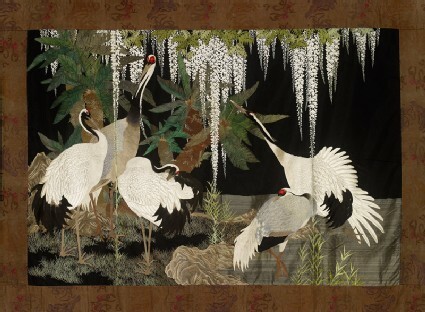 The direction of the stitches reflects the natural growth patterns of feathers and the scaly nature of the cranes’ legs and feet. The effect of the water surface in the lower right of the embroidery is achieved by individually couching down the long and extremely fine silk threads and incorporating slightly thicker threads to form the pattern of ripples. It is impossible to identify this magnificent and high-quality panel with any entry in Ingram’s somewhat perfunctory diary, or his list of purchases made in 1908. This is surprising as it would have been extremely expensive; it may not have been bought on this trip.